When I was doing my research for The Sheikh’s Disobedient Bride I found myself fascinated with Middle Eastern tradition of henna-decorating. I had a lot of fun writing the scene where Tally gets her hands decorated with Henna during her stay at Tair’s Bur Juman palace. Traditionally used in wedding ceremonies during ancient times, Henna (also known as Mehndi) is a natural botanical used throughout the world as a harmless, non-toxic body-dye. 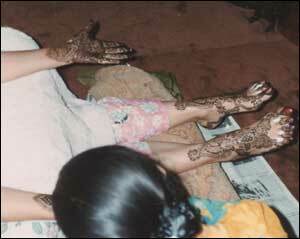 Even today, in India, Pakistan, Africa and other Middle Eastern countries, brides have their hands and feet decorated a couple of days before their wedding. Sometimes it’s a normal design while, as it was done for Tally, other designs incorporate the name of the husband on a bride’s palm – a romantic gesture of love and happiness. All women and children attending a wedding are encouraged to have their hands decorated – it’s a fun and festive tradition. There are other uses for Henna too. Some maturing men and women use it as a hair dye to hide their gray strands while others use it simply as a means of cooling off, especially in the hot summer months. Henna applied to the soles of your feet or in your hair is an old means of cooling body temperature. You can find many prepared Henna kits in the market today but these can be expensive so if you’d like to have some fun and still keep your costs low, check for Middle Eastern or Indian grocery stores in your area and buy powdered Henna from there. Be sure you get the right type of Henna for decorating. 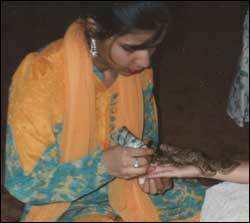 You want ‘mehndi’ Henna intended for use in body art. 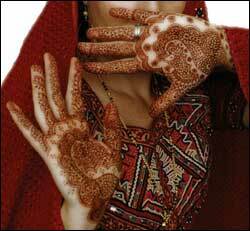 The Henna used for the hair is coarser and not fine powder as required for body art. Add the lime juice to the Henna powder a little at a time, stirring until it resembles the consistency of mashed potatoes. Cover and leave overnight. In the morning, stir a little coffee or tea into the paste until the paste is lump-free and softer then toothpaste in consistency. Cover and let it sit for 10 – 12 hours. Test paste consistency by making patterns with a toothpick or a plastic cone on a paper towel. If it’s too thick, add a little more coffee or tea. If it’s too thin, add a little more Henna powder. Henna body art lasts for several weeks and gradually fades over time. If you mess up with your design, just remove the excess paste with a cotton swab dipped in rubbing alcohol. You can use a toothpick or a matchstick to apply the designs but I find a disposable pastry piping tube or a sandwich zipper bag will work just as well if you snip off a tiny bit of one corner. After you apply the design, allow the Henna to dry for at least one to three hours. As it dries, the paste will harden, start flaking and fall off. Remove the dried Henna by applying oil (almond or olive oil helps enrich the color) into the skin and gently scrape off the paste with fingernails or the wrong side of a spoon. Henna is fun to try out with friends on a girls night in or even on your own. I hope you try it and get creative!